Albeit not as actively involved as he hopes, Chris tries to fulfill his share to that piece of community obligation the best way he normally can by picking up rubbish. Greater Good brings Chris Harris, serial entrepreneur, to the airwaves talking about the importance of providence and care for nature. In this interview, Chris mentions how he has learned to save and shares to listeners how he has come to value investing in the future. Find out more about Chris’ involvement in the community and the environment—and how his companies’ activities interweave to provide an effective and efficient production process. All these and more only on Greater Good Radio. An entrepreneur at heart, his core business philosophy focuses on privacy protection and environmental preservation through recycling. 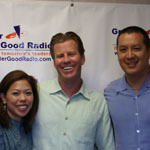 He has been in business since 1995 with a transport and parking company, and has gathered much experience and knowledge, which led to innovative ventures in Hawaii. He is co-owner of the only company in the State that makes products from recycled paper, Intech Management. Please welcome to Greater Good Television, Chris Harris. ·	He was a partner at Santa Barbara Parking Company, Mission Security & Control, and Shredex LLC in California. ·	His favorite books are Fish! A Remarkable Way to Boost Morale and Improve Results, The Ultimate Gift, Uncommon Ground, and Who Moved My Cheese!